Maybe it’s the UK climate? Maybe it’s the pace in which the installed capacity was deployed? Maybe it’s the CAPEX saving decisions that were made to buy cheaper cable? 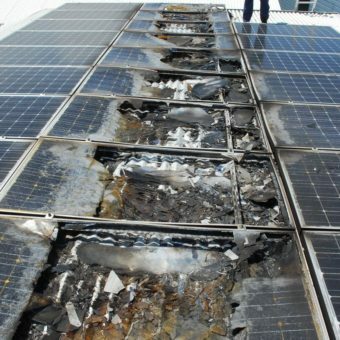 Electric Fires – There are dozens of reports in the media from around the world regarding solar related fires, although not explicitly stated, the probability is that the majority of them would have been caused by some sort of ground fault, short-circuit or DC connector issue. Electrocution – Reports of several international instances where arrays have been made live by a certain sequence of events relating to ground faults on DC cables. The Technicians need to take care with touching DC cables on the back of arrays. They must always wear gloves to at least give them some protection. Production losses – Most inverters shut down automatically if the insulation resistance is too low, hence causing direct production losses until these errors can be cleared. Sometimes due to environmental conditions the fault may disappear and rectify itself, sometimes it will take an inverter reset, but in most situations, a technician will isolate the string with the fault to get the inverter away. Cumulatively, there must be thousands of isolated strings with RISO issues out there in the field, which need rectification. Premature ageing of equipment (such as inverters) – With the operational cycling of inverters being more than it would be under normal operating conditions, inevitably certain components are going to suffer and may not last the full 20-25-year design life and will cost the owner more investment. The DC cables themselves will deteriorate with moisture ingress. No one involved in solar wants any of these things to happen. Not the investors, the fund managers, the EPC, the O&M or the OEM’s. But if left unchecked or only looked at in the summer months, then these tiny little defects can turn into big problems! Essentially, a RISO fault is an electrical pathway between one or more cable conductors and earth (ground). Such faults are usually the result of either small nicks or cuts made during the installation phase of a solar farms construction, or indeed the premature degradation of the outer sheath and insulation of the cable itself. Due to the ‘race-for-ROC’s’ in the UK (2011-2015) where over 9GW of ground-mount solar was constructed in a condensed period of time (and another 2-3GW of rooftop), there was the inevitable need for a mind-blowing volume of DC cable to be installed to formulate the strings of solar modules on each and every solar installation in the country. It is estimated that over 300,000 km of DC cable was installed during this period, with an estimated total capital value of £150M (cable only). Cobalt Energy suspect that a large proportion of this cable and its installation methods may be in question and unfortunately is a potential liability for asset owners into the future. Cobalt Energy are already involved and receiving enquiries for DC cable replacement projects in multiple locations throughout the UK. Buy Cheap / Buy Twice – When EPC’s were under considerable price pressure from investors during the boom, even one cent (EURO) saving per metre length significantly reduced CAPEX costs and meant that a large proportion of cable was likely to be purchased from less reputable manufacturers. Even though the cables have the relevant standards printed on the side, there is no real governance, or evidence of which batch was manufactured at which manufacturing plant. These cables are mass produced and bought in huge volumes. 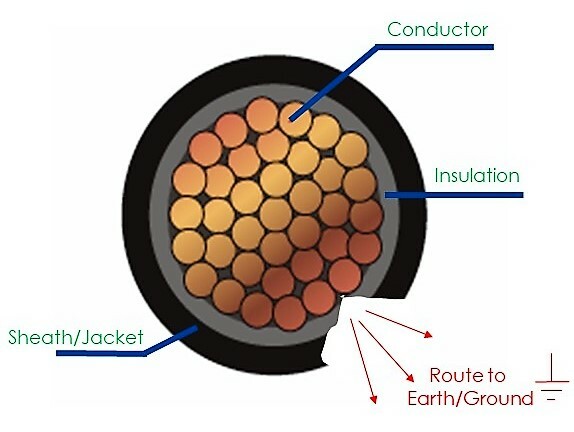 We are seeing a lot of non-UV-protected outer sheath cables out there which are breaking down even after a few years of operation, and there are also a significant proportion of red-coloured DC cables out there which are now non-compliant with the relevant standards due to the additives in the red dye in the outer sheath. 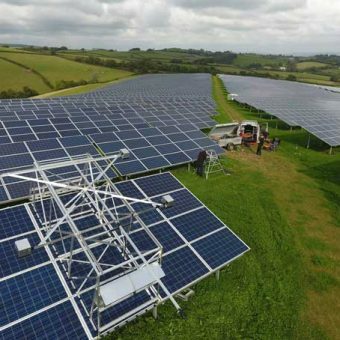 Can they handle the UK Climate – It is also noted that the UK climate and soil conditions are significantly different to those on the continent, and our fear is that these factors have not been taken into consideration when procuring these cables for UK solar projects. In most cases kilometres of DC cables are buried in underground ducts and are sat suspended in water for the majority of the year, and only in a small number of cases have we been able to find evidence that the cables are actually rated for such conditions. This not only increases the chances of premature deterioration of these buried cables, but from an O&M perspective, trying to find faults under ground and replace sections of cables is a real headache. The Race for ROC’s – Installation at pace during the summer months, causing a multitude of nicks and cuts in cables has caused a real nightmare for EPC teams commissioning in the winter months and O&M service providers who take on sites with a glut of RISO issues. Challenging to find at the best of times, current ‘trial and error’ detection methods with test equipment is time consuming and costly. In most cases, the rectifying contractor will narrow it down to a general location and then simply replace a longer length of DC cable rather than waste any more time trying to exactly pin-point the defect location. The practical challenge which faces RISO fault-finding and trouble-shooting professionals is that the faults are not present when its dry and in the wet they are everywhere. In fact, on some days you can be finding faults in the morning, only by 10-11am, they have simply disappeared. Of course, the very nature of the task is in many cases like finding a needle in a hay-stack. But what else can be done about this annoying material selection or installation method hangover? It is often apparent that DC cable management on many sites has not been carried out consistently or indeed to a high standard. Extreme cable radii, cables over sharp edges of mounting structures, exposed cables to UV between tables and modules, poor positioning of MC4 connectors so that water/moisture collects, unsealed or poorly sealed glands or ducting and of course general low hanging cables which have not been secured suitably. All of these small details do and will cause cable related faults. So, there is still time! As your O&M is carrying out their monthly inspections, get them to tidy up, it is in their best interest as well to reduce spurious faults. As part of our site assessment menu of services, Cobalt Energy also take a sample of DC cable lengths from around a site, clarify their manufacturer and where possible confirm the governance and suitability of the cable for any given site. On top of this we arrange for the cables to sent to an accredited laboratory for a full suite of tests. In some cases, our clients also request trench digging investigations to confirm the depth, current condition of the buried cabling, method and materials used when burying the ducting and cabling. The outcome of these types of investigations will confirm if there is a systemic problem or not and provide the asset owner, EPC or O&M with comfort that their sites DC cabling is what it should be. Of course, in cases where it is bad news, we will investigate the optimal solution to rectify. As well as the traditional PV testers / clamp-meters out there on the market, Cobalt Energy are currently trialling a ground-breaking piece of technology which can be used to locate specific ground faults in a given string, saving time and money. Using this specialist piece of equipment which is linked to your tablet or mobile, you can insert the string length and within 2 minutes locate the specific RISO fault location. The technician or engineer can then go directly to this point and insert a bypass to get the inverter back up and running whilst organising a replacement insert. This technology also works with open circuits, or poor MC4 connections which can be located in a similar fashion. Cobalt Energy’s aim is to be able to survey 100% of a site and be able to attach these RISO faults to specific assets on an interactive asset map, meaning that we or EPC/O&M’s could work their way through the site eradicating earth faults and removing the risk of ongoing effects. This method would be particularly sensible on a new build as part of the commissioning process. When detecting insulation resistance, the RISO value often fluctuates as a function of the PV system state (variable weather conditions), and the PV system may jump in and out of the ground fault state. In the field RISO faults are difficult to locate using ‘divide and conquer’ methods and interventions may happen in vain, simply because the fault is gone when the technician arrives at the PV site. This impacts O&M costs directly. The technology under trial can point out ground faults up to RISO ≈ 3 Mohm, which means that even though the system is producing, the technician/engineer may still find the weak spot and make sure production is not interrupted. This test device also works under low light conditions down to 10% of full daylight, so working window is also as wide as it can be, particularly with the evenings drawing in. With DC cables being the capillaries of the solar PV system, transporting the renewable power away from the photovoltaic cells, it is absolutely critical in Cobalt Energy’s view that the sector wakes up to this potential ticking time bomb. All the focus seems to be on modules, inverters and HV equipment as they are the big capital purchases, but collectively from Cobalt’s market experience DC cabling on a site makes up 4-6% of the CAPEX costs (material, civils & install), but could eventually affect 100% of your site and production revenues. Cobalt Energy would recommend to all asset owners, EPC’s & O&M’s to focus in on their DC cabling and invest in expertise to understand what is installed on your sites and in what condition it is in.